Status: online So, I was messing about with HLYA's Pskov defense seeing if I could recreate it and I was running some tests. I ran through it completely the first time and didn't get anything like the results he gets. So I ran another test independently seeing what it would take to build a fort. Either i am missing something or the game is totally screwed. How can it take this many turns to build a fort 1 (or rather, still NOT have a fort)? And just for clarity, i do understand that perhaps zhukov should have been assigned to an army and other changes. But it shouldn't matter. 3 Units in a clear hex for 4 straight turns with an ever increasing construction value (started on t1 as like 39 or something) with countless conscruction brigades in range at max toe and they can't build a level 1 fort when the lowly MOT unit next to them does..... Makes absolutely not sense. Status: offline Doesn't the enemy have to be close for fort building? Doesn't the enemy have to be close for fort building? Adjacent only for a level 3 Fort (OR in Urban OR Adjacent to a FORT Unit). So that's not it clearly. One thing that seems clear to me is that the manual is very out of date relative to the ongoing patches. The manual i'm using has a 2013 date...Is that right? Seems like the game is all voodoo nowawadays and really I'm not sure why it keeps changing. It's like a modded game now with no documentation. It's really quite simple and perhaps I've made it more confusing than it needs to be. I started the game human on human and on GHC Turn 1 I did nothing other than hit end turn. On SHC 1, I moved like a grand total of 4 units. I put the HQ in range, I put the 3 units I've noted in a clear hex, and I built a ton of extra construction units in the Front HQ. So just put a few units into a clear hex, made sure that the Command chain was good, built some SU's, and hit End Turn. 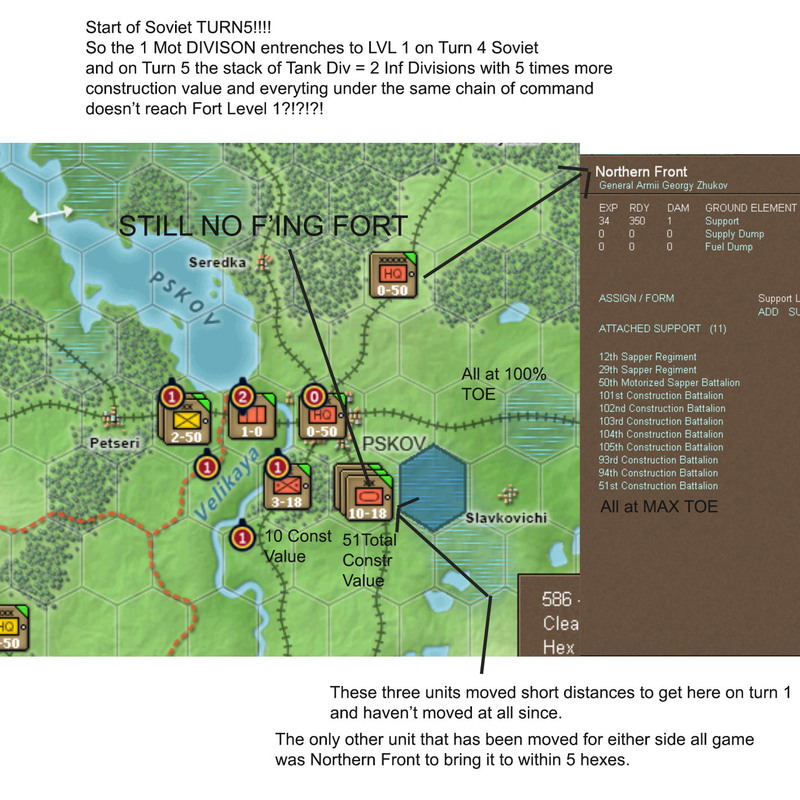 Then I did nothing other than hitting end turn for both sides until I wrote this post at Turn 5 start. It's inconceivable to me that 50+ total Constr Value (2 Inf Divisions and 1 Tank Div) can't build a Fort Lvl 1 with all of that construction support in that amount of time. As you point out, without any Fort level they should be getting BONUSES to build the Fort...but nothing. All of them MAX TOE including support. The MOT Unit next to them built to Fort 1. It's crazy man. I just ran through another turn (had company over which pulled me away) and FINALLY when i opened the start of SHC Turn 6, there was a level 1 Fort. And just to clarify, I ran this test twice with very similar results. Even more bizzare is if you look at my screen shot above - the lvl 2 forts west of them degraded to lvl 1 before those three units could build a lvl 1 fort. Huh? Pehaps the range is above 25 I am not remembering correctly, in that case you could just be cusping the build range meaning 2 of your hexes are building but the other hex with a 3 stack is not? Status: online I just ran another test doing nothing at all but hitting end Turn and the front lines are all level 3 forts by the end of turn 2.....going to run another test where on GHC T1 I'll break the front lines and put a Panzer Division as close to PSKOV as I can get it and see if that changes anything...………. The degrading ones i pointed out were level 2 to start and went to level 1 before 3 divisions could build a level 1. Totally strange.... This time i did way less to set all of it up, all i did was move a GHC PZ Div across the Daugava and stuck 3 soviets units in the same hex and sure enough, Fort Level 1 in place at the start of SHC Turn 2. Seriously, is there an updated manual somewhere? Is my 2013 manual the last update of the full manual? Where does it say at what range that the enemy effects fort building and by what %? I would definitely recommend getting that, just try to shoot him a thank you for all his hard work if you get the chance! *EDIT* Disregard this, it must have been that the Finns unfroze thus satisfying the 25 hex thing. Status: offline Ah well that is good to know Matt, thanks for the tip! I will have a look at it myself but perhaps the rate is just drastically reduced or limited to some degree if you are correct?